A new Messiah Stride appears, meant to explosively alter the field. AUTO (VC): [Counter Blast 1 & Choose 1 face-down card in your G Zone with the same name as this Unit, flip it face-up] When this Unit attacks, if your Heart Card is a 〈Messiah〉, you can pay the Cost. If you pay it, for each face-up card in your G Zone, choose 1 Rear-guard and 1 Locked card among all players, you can Lock and/or Unlock those cards. If 1 or more cards is Unlocked, draw 1 card. AUTO: [Soul Blast 1] When this Unit is Unlocked due to your Vanguard’s effect OR during your End Phase, you can pay the cost. If you pay it, Draw 1 card, and Counter Charge 1. For Today’s Card, we’re introducing two cards from the 6th Clan Booster “Rondeau of Chaos & Salvation” (on sale October 20th, 2017), the Grade 4 〈Messiah〉, “Genesis Dragon, Basaltis Messiah” and the Support Card “Globule Dobel”. 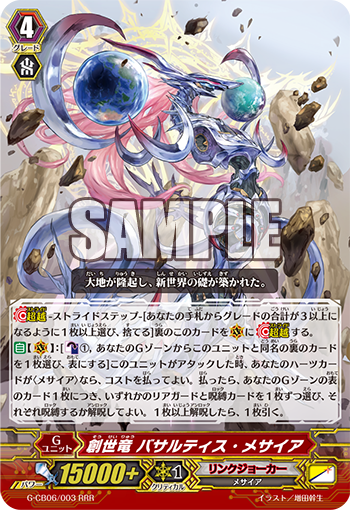 “Genesis Dragon, Basaltis Messiah” is a card that can 【Lock】 and 【Unlock】 when it attacks. When it attacks and you have a 〈Messiah〉, you can pay the Cost, and for each face-up card in the G Zone, you can choose 1 Rear-guard and Locked card among both player’s fields, and Lock and Unlock those cards! By Unlocking for Multiple Attacks while at the same time Locking to impede your opponent’s attacks. So aim to activate this card’s ability with cards that can Lock themselves, such as “Sacrifice Messiah”. Also, if 1 or more cards is Unlocked with this Skill, Draw 1 card. You can activate it during your First Stride for the aim of increasing your hand. Also, “Globule Dober”, is a Unit whose ability activates when it’s Unlocked. When it’s Unlocked by the effect of a Vanguard OR During the End Phase, by paying the cost, you can Counter Charge 1 and draw 1 card! By activating the Stride Skill of “Alter Ego Neo Messiah”, you can easily meet the conditions, so continuously attack while recovering a Counter Blast!